Dras’s reaction wasn’t quite so extreme, but you could tell he was happy. His long legs locked at the knees and his beak dropped open. His eyes gleamed with happiness, then glazed over as he imagined himself playing an instrument in front of millions of clapping, cheering Neopians. Sky’s eyes grew wide, and she covered her beak with the white-tipped talon of a faerie Pteri. My talons were a golden-brown, long, curved, and dangerous, and tipped with black. I grinned and spun around on one talon when I heard the news. “What instruments will we get?” Hiyathererocks asked, the first one to ask the question we were all thinking. “Whatever you want,” she replied smoothly. Then she left for school. That afternoon, she was back. She was holding a case in one hand, light brown, about a third the size of a suitcase. It had a rough surface and was embossed with gold lettering that spelled out the name of a company. Ducky opened it, revealing pieces of an instrument, the silver and black standing out against the red velvet. I gently ran one talon over one piece, afraid that my strong Darigan Pteri talons would damage it. Ducky put it together to reveal that the jumble of pieces was actually a clarinet. She put on a reed, and began to play. The music was amazing, like nothing I’d ever heard. The notes were smooth and gentle, not too high and not too low. It was different from the loud, blaring music of concerts. It seemed to calm me, and I closed my red eyes as she played. Oh, sure, there were some wrong notes here and there, and a few squeaks, and some notes that didn’t come out. But she was still learning, and this was only Ducky’s second year of playing the clarinet. “May I hold it?” I asked breathlessly while my siblings looked on in awe. She nodded, and I lifted one trembling talon to the smooth black wood, grabbing it securely with the back toe of my right talon. Ducky moved my right talon down to the long piece that was close to the bell and put her hand on the upper piece, the one closer to the mouthpiece. Just then, she looked at her watch and yelled back to us, “Gotta go! Think about what instrument you want!” And away she went. “I want a saxophone!” Hiyathererocks exclaimed, holding one talon in the air and pretending to press down buttons while singing a jazz tune. “I’ll be the AWESOMEST!” He hopped around on his one talon, still pretending to play jazz on his air-saxophone. Dras grinned. “I’d like a trumpet! They’re a challenge to play, with only three valves, but they aren’t as hard as French horns. And plus, they’re loud!” Again he got the faraway look in his eyes, and you didn’t have to be a mind reader to know what he was thinking just then. “Flutes are cool,” Sky said. “They sound like little beekadoodles and kateils and petoots. They’re so happy and bright and make beautiful high sounds. I listened to one yesterday in the band room of neoschool.” Her chirp was bright and happy, high like the sound of a flute. Finally Hiyathererocks turned to me. “What instrument do you want to play, Tah?” I liked that he still used his pet name for me, the one he had used before I was painted Darigan. It’s not like I hate being Darigan. I love the strong wings and sharp talons, and I love the colors. But I don’t like how everybody treats me differently now- except my siblings. Dras is still the smart one, and the second oldest even if he acts the most mature. He’s also the calm one. Despite being Ducky’s first- and oldest- pet, Hiyathererocks is energetic, hyper, and outgoing, not to mention athletic. He’s always full of crazy new ideas and a whole lot of energy to use on them. He’s humorous too- always has something funny to do or say; sometimes making me laugh so hard I almost crash-land. And Sky- well, I was painted Darigan before she arrived. But she’s shy, quiet, and nice. She’s the youngest, but those faerie wings have helped her perfect her flying technique. They’re the same and so am I. My color has nothing to with it. I was brought back to reality rather roughly, with a talon tapping me on the head. Of course, the talon in question belonged to Hiyathererocks. “I SAID what instrument do you want?” he asked irritably, though his beak was curved in a smile. The next morning, before she went to school, we told Ducky our desired instruments. She nodded, and said she’d get them for us in the afternoon. All through neoschool I couldn’t focus, my mind stuck on one subject- I would be getting a beautiful, beautiful clarinet soon. When we got home, I looked around excitedly for Ducky and found her sitting outside, waiting for us. “Let’s go, what’re you waiting for?” she cried ecstatically, like she was the one getting an instrument today instead of us. “Yeah, all right!” cried Hiyathererocks, his loud screech drowning out all our voices. We went to the shop wizard first and bought a trumpet. Ducky was delighted when she looked at the 1500 neopoint price tag. Hiyathererocks’s incessant begging forced her to find a saxophone next, and again she squealed. 2000 neopoints. Our owner grimaced as she coughed up 10,000 neopoints for Sky’s flute, though she was happy for our gentle sibling. She shot a warning look to my brothers, who were brushing the instrument cases with their talons, longing for the time when they could be opened. Finally it was my turn. Ducky hissed as she reluctantly handed the shopkeeper 13500 neopoints, but smiled as she handed it to me. I gasped, all the breath leaving my body as I gazed at the instrument. The case was a deep, rich brown, emblazoned with the company’s name. I looked inside, marveling at the sheer beauty of the instrument. Before we left, she turned to the shop wizard JubJub. “I only know how to play the clarinet, and I don’t know how to teach them how to play. Can you recommend a teacher?” she asked, looking down at the JubJub. “Sure can,” he said confidently, giving her a card with the teacher’s address on the card. 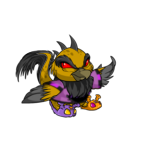 “Name’s Phyrus, he’s a Lenny, so he knows how to teach your pets who’ve got talons instead of fingers.” Ducky thanked him, then began the short walk back to our neohome in Neopia Central. “Now, the first thing I’m going to teach you is how to hold your instruments. Ducky says you all know how to read music, correct?” Phyrus asked, his green and white speckled feathers trembling as he spoke. Our Lenny teacher was old, but kind, though he looked too frail to create the loud blasting notes of a trumpet, or even the soft, delicate notes of a flute. We nodded. Ducky had, in fact, taught us how to read music. She insisted that we know how so that it would be easier for Phyrus to teach us. Plus, having him teach us how to read music would’ve cost an extra 2000 neopoints. “Good, good!” the Lenny said, his eyes brightening. “Back to the instrument holding. Since each of you plays a different instrument, you will have to learn. Since this lesson is simple and takes only a little bit of time to learn, it will be the only lesson you all have together.” Phyrus walked around, telling my brothers and Sky how to hold their instruments. “You will need to use both talons to hold them, so you’ll have to sit down.” Amazingly, even Hiyathererocks obeyed. Even though it felt strange to be sitting down instead of perching, the clarinet itself didn’t feel like it was a weight in my talons. It felt like it was supposed to be there, like it was only natural, only normal for me to have a clarinet in my talons. “But it was horrible!” I cried, my eardrums still aching. I sighed and tried again. The bright happy notes of the carol came out of my clarinet... Correctly! I grinned, and Phyrus did too. I was definitely improving, and it was getting easier for me to play the new notes I was learning. The clarinet now seemed to be helping me. Its notes were becoming the crisp, loud, bright things Ducky’s were, like a young Pteri learning to fly. I gasped, my eyes widening. I couldn’t do it. That was the first thought that entered my head. It would be too hard. Phyrus seemed to guess what I was thinking and his old, bright eyes sparkled with amusement. “You can’t say no. I signed you up already.” I opened my beak to protest, but Phyrus just handed me a sheet of music. “Learn to play it,” the old Lenny cawed, and I knew that refusing was out of the question. “That sounded right!” Hiyathererocks said encouragingly. I sighed and resisted the temptation to throw my clarinet against the nearest hard surface. “It wasn’t,” I replied crossly, my feathers beginning to stand up. That evening, I heard Dras practicing. He too made mistakes, though the notes from his trumpet were loud and sharp. He seemed to have gotten the notes right, and was just having trouble with the rhythm. Even though he wasn’t playing it right, he looked as though he was enjoying himself. Sky’s flute made soft, delicate sounds, little pieces of glass that sounded as if they could be broken any minute. She closed her eyes while she played, allowing the soft, beautiful music to wash over her feathers. The faerie Pteri didn’t seem to notice me standing there, and I quietly backed away. It was the night of the concert. We were playing with about ten more of Phyrus’s students in the Tyrannian concert hall. In fact, Phyrus himself was playing. Though he could play all the instruments well (he was our teacher, after all) he had decided on the French horn. The conductor, a small shadow Xweetok, raised her paws, waved the baton a few times, and the concert had begun. I had never played better. The swift, challenging music that I had struggled over for so long finally seemed to make sense. The notes flowed out of my clarinet gracefully in the slower parts and rapidly when the music got faster. I played high notes and low notes and notes in between, all the while keeping with the Xweetok conductor’s rhythm. I snuck a peek at Dras to see that he was blaring his notes loudly, throwing them like yooyus far into the crowd. His trumpet seemed to wink at me, as if to say, ‘I know what I’m doing.’ He had finally achieved the dream he had been waiting for since he had gotten his trumpet. He was now playing incredibly well, in front of thousands of Neopians. Sky, sitting across from me, had her eyes open this time to read the music. Her flute was delicate and wavery sometimes, but was also clear and sharp and bright in the places where the flute needed to be heard. Her music seemed to hover in the air before falling gracefully into the crowd. The four of us seemed to hear each other and help each other. When Dras slipped on a note, Hiyathererocks covered him up with a loud, blaring note of his own. When Sky’s note petered out, not held for its full length, I blew harder into my clarinet to help cover the sound. When Hiyathererocks played a wrong note, Sky trilled her flute loudly, covering his mistake. And when I went too fast, Dras played the correct rhythm slower, covering me. As the concert ended, we were all out of breath, our faces red and our lips and mouths sore from holding the instruments through swift, complicated music. We stood up, our talons also sore from moving rapidly up and down instruments, and took a bow. When we came up, we could see Ducky in the front, clapping and cheering, so happy she was on the verge of tears. And that was the most rewarding thing of all. If you're reading this, then I got into the NT for the first time! Woohoo! What ever can I do? What foulness was the cause? Was it that evil brew that came from Krawley's claws? Do you think he's changed?